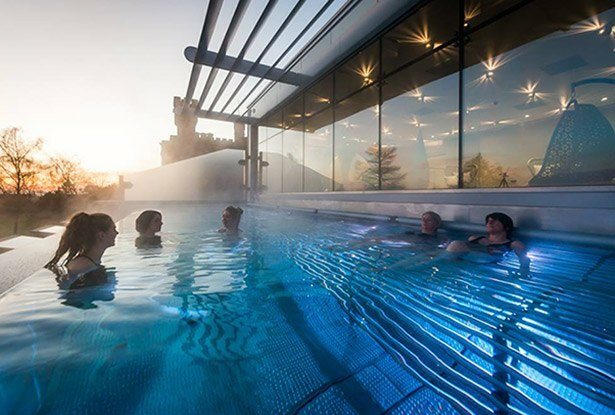 Ragdale Hall’s latest exciting development – the Rooftop Infinity Pool and Lounge and stylishly refurbished Exercise Pool – is now open. This new facility will provide the most impressive and extensive spa facilities anywhere in the UK. The main contractor for the project was Taylor Pearson Construction, the architect was William Saunders and the stainless pool tank was designed and manufactured by Berndorf Baederbau in Austria. The 12m x 3.5m stainless steel pool and features reclining underwater massage jet seating, coloured underwater lighting, an infinity edge, and is heated to 35 degrees. F T Leisure was responsible for the design, supply and installation of the water treatment and filtration systems for the pool.